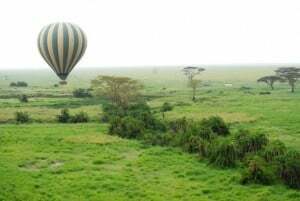 Book a balloon flight over the Serengeti. With this flight you fly over the grasslands of the Serengeti. You will see the most beautiful panoramic faces of large groups of animals which walk on the ground. You will experience the Serengeti from a completely other side, an experience which you will never forget! At five o’ clock in the morning Serengeti balloon Safaris picks you up at your hotel / camping site. Serena Lodge, Seronera lodge or Sopa lodge, or one of the central camping sites in the Serengeti. Then you drive to Maasai Kopjes to your departure point. Here you will meet your pilot, and you get a short explanation of what will happen. In the meantime the balloon is prepared for departure. You take off at sunrise and you will determine the altitude with your pilot. At times you will fly on tree top height, other times at an altitude of approximately 1000 metres, so that you can enjoy your view optimally to see the animals and the best panoramic sights. The silence on this altitude is inconceivable. The balloon flight lasts approximately one hour. After the landing a traditional “Out of Africa” breakfast is awaitening you, in the middle of the bush with splendid linen, table cloths, silver cutlery and champagne. Afterwards you receive a Serengeti balloon certificate, if proof of your flight, and you are driven back to your hotel/camping site, where you go on with your programme. the most beautiful panoramic faces of the large groups of animals which walk on the ground.